And this one is from the classic iconic shoes, we all wish we have or had. If you have 7 to 9 weeks to wait for a pair of customized shoes, then Ferragamo Vara and Varina are so worth the wait. Celebrating Vara which has been around for 35 years and her sister, Varina (a ballet flats version of Vara, launched in 2007), now we can have our own customized version. Almost every part of the shoe can be customize, from their material, color, initials and width, to bow and hardware. Our initials (only 3 letters allowed) will be added on the sole on a metal pale, which is the same color of the Ferragamo’s hardware. And if you have extra wide feet, no fret, they have the right width for you. Check out my version of Vara and Varina above. Click here to customize yours. They cost US$550/pair, which I personally think will be (another) great fashion investment of mine (and yours?) since these shoes will never goes out of style. I mean, come on, they were worn by Marilyn Monroe to Carey Mulligan. The shoe history speaks for itself, really. They sure took a long way to be emptied, but as one emptied, time to move on to new beauties. Majolica Majorca Puff de Cheek : bought them in HK because of its’ packaging cuteness. The peachy color looks good on cheeks, not shimmering, but it didn’t win me on the long lasting category. Repurchase? I don’t think so. Anastasia Beverly Hills Eyebrow Pencil: bought them in BKK when I visited their salon to fix my brow. I love it, it stayed until I took it off, didn’t smudge when I accidentally rub my eyes (don’t you hate that when it happened?) and a perfect natural shade for my eyebrows. Repurchase? Unfortunately, this is the old version of their eyebrow pencil. But I’m definitely gotta buy the new one. Smashbox Contour Palette : bought them online. 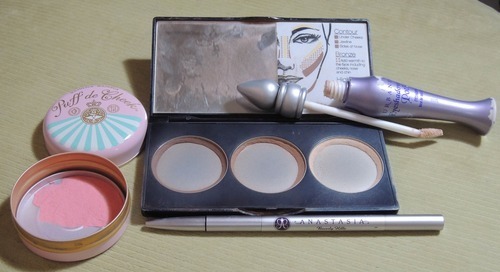 It did come with the small brush which surprisingly did OK contouring. I love how pigmented they are, even though for beginners, it will take a while to get used to blending the three shades right. Repurchase? Maybe. Urban Decay Eyeshadow Primer Potion : bought them in Singapore. My holy grail of eyeshadow primer, which never fail. It has the right consistency of texture (not too liquid or too thick), it gave the matte look and last until I took my eye makeup at night. Repurchase? I had a new one already in my beauty case. Case closed. IS IT POSSIBLE TO RECONSTRUCT OUR HAIR? The answer is yes. So be prepared to say au revoir to those brittles and split ends. The good news is you’re not alone in these damaged hair categories. “For Indonesian women, split ends, fragile and damaged hair are number two hair problem. The causes are technical aggression and chemical aggression. Technical includes: sun exposure, chlorine in water, hair styling (blow dry, ironing, combing and pony tails) and poor nutrition distribution on longer hair. Meanwhile, chemical aggression happened due to chemical services like coloring, straightening or curling without proper treatment,” explained Hendra Purjaka, Senior Education and Commercial Manager Kérastase Indonesia. Level 1: when hair cuticle (that’s the outermost part of the hair shaft) split with a rough surface. Level 2: hair cuticle is open and split. Level 3: hair surface damaged and peeled. See the cortex layer (that’s the center part of hair which gives elasticity to our hair) opened. Level 4: the worst condition of all when the cortex layer look very damaged with total hair erosion. So, how to detect your level of hair erosion? I identified mine here and found out that my erosion scale is number 3. Ouch. And I thought my hair looked OK from the outside. While highly professional diagnostic can only be done in salons, but there’s help for treatment at home. Two complete range for four different levels of damaged hair. Kérastase Force Topseal range for hair erosion level number 1 and 2, and Kérastase Force Architecte range for hair erosion level number 3 and 4. The latest, Kérastase Force Architecte includes: Bain Force Architecte (shampoo), Masque Force Architecte (hair mask) and Fibre Architecte (hair serum). With cutting edge new technology, Cyment- cylane3 complex, the range is recommended for daily use in whole regimen to achieve revitalized and reconstructed hair at each fibre. And they’ll also help to prevent more breakage and split ends. From now, consider any level of your damaged hair problems solved. STILL LOOKING FOR THAT “PERFECT” SHIRT? Ah…the never ending quest of a classic fashion item. Carolina Herrera is a big fan of a white shirt. Such a big fan, once she said, “Trends may come and go, but nothing will ever beat a white shirt.” Errrr…she is a designer and I personally think she never had a problem with that open gape over the bust. But for us, it’s still a big homework to find the perfect one. Once I’ve ever tried that fashion trick to put on double-sided tape, and failed. It helped to keep the gape closed, but that gooey sticky thing ruined my white shirt for good. Tired of fixing the shirt gape, I’ve lost my interest in any shirt. Until I’ve heard about “The shirt by Rochelle Behrens”. She cleverly came up with the solution for this small but pretty annoying problem. Her dual button technology seamlessly designed into each of the shirt, making sure it’ll remain close until you’ve decided to take it off. How awesome! Instead of just classic shirts made from Italian cotton, this label is expanding to silk blouses and shirt dresses as well. I love their silk shirt dresses, which can easily go from day to night with all the right NOW colors. Currently sold in the US (Bloomingdales and Fred Segal) & Canada. HOW WOULD YOU LIKE YOUR HOME TO BE STYLED? If you answered as stylish as you, then Missoni Home will blow you away. Those iconic zigzags prints for the bed room, bath room and living room? Yes, home is not just where the heart is, it is where your style judged. For 2013 collection, it’s a celebration of flowers, daisies and poppies to be exact. Printed on materials such as linen, light cotton satin and velvet for sofas, they’ll surely brighten up our home décor. Just perfect for those stylish yet sunny and creative personalities. Are you one of them? Missoni home is available at their showroom stores in Milan, Sao Paulo, Jeddah, Helsinki, and the latest in Southampton, New York. …especially if you’re one of those ‘return to nature’ type, very into natural skincare and searching for the very best for your skin and yourself. Then, you’ll love ALPURE. Made entirely in Switzerland (known for their quality and purity), their counter in Galeries Lafayette Jakarta is the first in Indonesia (so exclusive, even Singapore and Hong Kong haven’t carry this brand yet). So what differs ALPURE from their competitors, other Swiss’ brands? This high end skincare products are the first skincare line with 100% natural ingredients from the Swiss Alps. Ingredients cultivated in strict accordance with Swiss organic standards. More than 20 species of endemic plants with effective cosmetic properties, are used to create a unique and rare cocktail, together with a special Glacier water. OK, imagine Switzerland with their white top (covered with snow) mountains like all the time. Actually not, they’ll melt on summer (usually in July and August) and that’s the perfect time for ALPURE to collect these precious water. Currently, they have three lines in Indonesia, named Bio-Alpine (Anti-Ageing line), AltiSource (Hydration line) and Systeme-Pur (Preparation line). Silky and gentle textures with subtle fragrance, ALPURE offered a simple skincare range and affordable luxury Swiss product. New brand fascinates me all the time, and the best way to try them is going for their best seller products. Turned out, ALPURE has three best sellers from each range, 3in1 Toning Cleanser, Anti-Ageing Eye Cream and Intensive-Hydration Re-sourcing Mask. I can see why they become best sellers, the cleanser is truly a three in one product, combining cleansing milk, toning lotion and purifying gel. It cleansed non waterproof makeup perfectly, leaving skin soft and purified. And the Anti-Ageing Eye Cream is so cooling when applied, thanks to its’ decongestant effect. Good for puffy eyes, those swollen looking eyes when we wake up each morning. It’ll also help smoothen those wrinkles & fine lines, and the enemy of all beauty states, dark circles. Another cooling product is their Intensive-Hydration Re-sourcing Mask. They remind me of those butter spread packaging when you have breakfast in the hotel. With their ice-cube effects, it’s the answer for very dry and dehydrated skin. Put it inside the refrigerator (not freezer) for 10 minutes before applying and feel the cold sensation on your face and neck. Leave for another 10 minutes then wipe, this non-masking mask can also be leave overnight if you fell like your face are that dehydrated. Just apply thinly and leave them to work overnight. ALPURE price range is quite affordable for such quality, they go from Rp 450.000 (for 3in1 Toning Cleanser) up to Rp 975.000 (for Firming Cream). Good news, they’re having their opening promotion until June 12, 2013. When you buy any ALPURE product, they will give you an AltiSource trio sample card (with their best seller mask inside). Hurry to their Galeries Lafayette’s counter (at Ground Floor) while stocks last. For me, changing fragrances is not just to suit my moods. I’ve learned my fragrance lessons 101 well throughout my traveling days. Some fragrances (even those with big names) suddenly failed on me when I bought them in colder climates cities, and wore them here in my home town which is hot and humid like all the time. They just smell…well…different. That’s why I started to believe that some fragrances are just best to worn where they produced…. ….until this week I was invited to the launch of the latest Diptyque fragrance, named L’Eau Du Trente Quatre in The Papilion Duo, Jakarta, Indonesia. Seems like the good people at Diptyque can read my mind and needs, they created a new version of their original 34 Boulevard Saint Germain (named after their boutique address in Paris/the place where Diptyque was born in 1961). A greener interpretation, more playful and definitely lighter, Diptyque L’Eau Du Trente Quatre is the perfect fragrance to accommodate warmer climate and suit our forever summery mood. Thanks to the green scent of birch tree leaves, a unique cocktail of bitter orange, verbena, lemon, grapefruit and lavender as top notes. A pinch of nutmeg, juniper berries and cinnamon tree leaves sets the floral heart of Egyptian geranium and tuberose. Last but not least are the base of Virginia cedar, patchouli, a hint of incense, Spain cist and bright musk which balance this genderless fragrance into one unforgettable scent. Diptyque L’Eau Du Trente Quatre comes in a white cap with the same oval bottle as the 34 Boulevard Saint Germain (which comes in a black cap, by the way). And its’ box represent a more feminine side of the brand, to commemorates the grey and pink fabrics produced at the beginnings of Diptyque with a special Pretorien motif. Currently, they carry two sizes (50ml and 100ml) of Eau De Toilette, but let’s hope they will expand this versatile new scent to solid perfume and home fragrance as well. See how flawless the model’s skin after being touched up with the product? I’m talking about 8, yes 8 in one beauty product. Dr. Christine Schrammek (she was a dermatologist which created the first ever BB Cream in the world) would be very proud to see that she had created a craze in beauty business. While the first BB Cream was used in German on 1960 to treat post-op patients, it was getting hipper when it was introduced in Japan and Korea in 1985. Many Korean Pop artists used it to create flawless and healthy looking skin and (boom!!!) every one wants it…. Shiso (which widely used in Japanese food), believed to reduce early melanin-making signals for brighter and luminous skin acts as the main ingredient. The other formula is vitamin C, liquorice and Community fair trade aloe vera from Guatemala, promised to brightens, soothes and protects skin against UV with SPF 25PA+++. So, how do I like it? As I already have a fair skin color, can you tell from my pictures above that I actually got fairer? But look at the flawless finish and its’ ability to cover my dark under eye circles without the help of any concealer. I used one pump for the whole face and apply the rest on my neck. I can feel the different texture with their All-In-One BB Cream which I’ve reviewed previously here. This BB Cream is smoother, lighter and creamier with one radiant beige shade suits all. With the help of setting powder for the final touch, I believe that my skin stayed matte longer. The Body Shop Moisture White Shiso BB Serum Inside is now available at The Body Shop Indonesia’s stores, or you can buy it online here. They said, every day is a fashion show and the world is the runway. You bet! For those who fear not to make any statement that stick to any part of your body, embrace “Heavy Machine”. Footwear brand established in 2010 by Michelle Wu, born in Taiwan, live in Italy. She was inspired by industrial machine structures and heavy strong lines which delivered a hell out of statement shoes collection. Not just trendy, her shoes are edgy, strong, yet feminine in the same time. Check out my faves from her SS 2013 collection, with such modern, architectural, bright and bold vibes. Made out of high quality calf leather and all made in Italy, I can’t wait for “Heavy Machine” to reach Indonesia (currently the nearest country available in Taiwan). Well darlings, if you want to become the center of any attention, make sure to wear the right kind of shoes. Check out the super tiny gold particles inside the mask. Can you spot them? Caroline Dery, Group Product Manager Kérastase. Check out my shiny, healthy, happy hair, people. Trust me, if you ever tried one of Kérastase’s Hair Rituals, you’ll forget there are cream bath or any other similar but not the same hair treatment. It’s a ritual like no other, it didn’t just make my hair look good, it made me feel good. Gorgeous healthy hair that bounced with glory every time I walk, will definitely made my day. I bet you too. After the marvelous launching event of Kérastase Elixir Ultime Grands Crus (see it here), Kérastase Indonesia invited me and a few other bloggers yesterday to experience their latest Hair Rituals, 24 Carats Ritual. Just like its’ name, the pure and fine gold measurement, the ritual itself is really a luxurious experience. Tailor made, just like the other Kérastase’s hair ritual, but this time using Kérastase Elixir Ultime’s range, including the predecessor Kérastase Elixir Ultime and the latest addition: Sublime Cleansing Oil Shampoo, Beautifying Oil Mask and Grands Crus. Frankly speaking, I was being skeptical at first as I have super oily scalp and the thought of washing and treating it with oil didn’t thrill me. But, boy…was I wrong. The shampoo effectively cleansed my scalp without weighing my hair down. The mask, which actually looks like a thick cream mixed with gold flakes crushed, nourished my hair completely, leaving them with a lustrous looking shine. As for the Grands Crus, it completed the whole ritual by its’ divine scent. If they did ‘magic’ to my short hair, imagine what they can do for longer hair. Let me share my 24 Carats Ritual’s experience at Irwan Team Hair Design, Grand Indonesia, Jakarta. First the therapist applied Elixir Ultime Oil to the scalp and shafts on dry hair (pre-shampoo), and massage for 5 minutes. Then, shampoo with Sublime Cleansing Oil Shampoo. The therapist blend about two spoon of Beautifying Oil Mask, two drops of Elixir Ultime and Grands Crus (I personally picked THÉ IMPÉRIAL for the colored hair) and he applied them generously on the shafts. Cold steam for about 10 minutes, while the therapist did hot stones massage on my back, hands and feet. Rinse without shampoo and preparing for blow dry with a drop of Grands Crus THÉ IMPÉRIAL. As you can see from my pictures above, my hair looks like they have just been revamped. Though I don’t have Giselle Bundchen’s long shiny locks, I’m quite happy with the way they bounced healthily and most of all smell incredible. “Your choice of Grands Crus is actually inspired by Chanel fragrance’s, Coco Mademoiselle,” said Caroline Dery, Group Product Manager Kérastase. After our 24 Carats Ritual’s experience, a beauty luncheon was held and Caroline explained more about the Grands Crus line. “ROSE MILLÉNAIRE suited for the passionate moods, MORINGA IMMORTEL for the elegant in you, THÉ IMPÉRIAL for the romantics and ELIXIR ULTIME for the glamorous.” If my choice (THÉ IMPÉRIAL) was inspired by Coco Mademoiselle, MORINGA IMMORTEL was inspired by Kenzo Flower, while ROSE MILLÉNAIRE was inspired by Aromatonic from Lancome. Yes, everyone would be able to find an elixir suited for their hair type or just to suit their mood. But, don’t just take my words for this special hair ritual. Seriously, you have to feel it yourself to believe it.